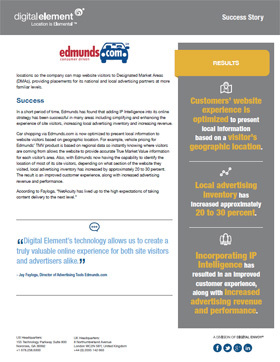 Edmunds.com Drives Towards Success by Leveraging IP Intelligence to Enhance the Online Experience for Site Visitors – and Increase Revenue for Online Advertisers. 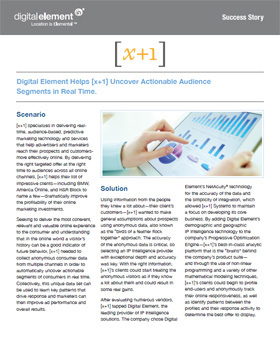 Digital Element Helps [x + 1] Uncover Actionable Audience Segments in Real Time. 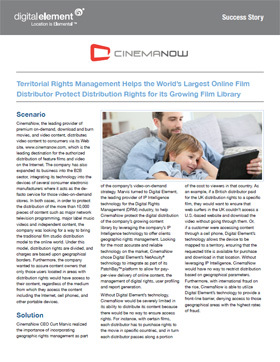 Territorial Rights Management Helps the World’s Largest Online Film Distributor Protect Distribution Rights for its Growing Film Library. 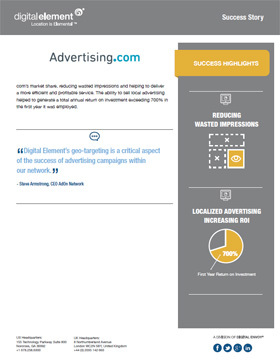 Advertising.com Harnesses the Power of Digital Element’s NetAcuity® to Serve Geotargeted Ads and Deliver Increased Revenue. 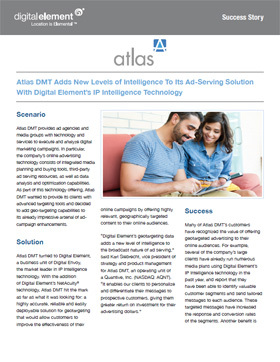 Atlas DMT Adds New Levels of Intelligence To Its Ad-Serving Solution With Digital Element’s IP Intelligence Technology.